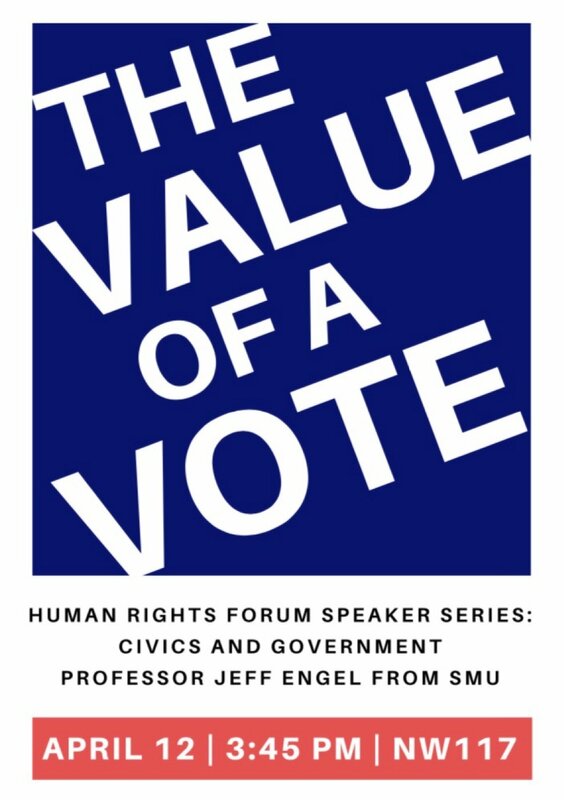 This past Wednesday, the Human Rights Forum was lucky to host Professor Jeff Engel from SMU's History Department. His presentation focused on American government and more specifically, the value of a vote. We saw this historically-focused talk as a great way to both take a break from the exhausting current issues facing our country and learn more about our role in making our shared world a more just place. 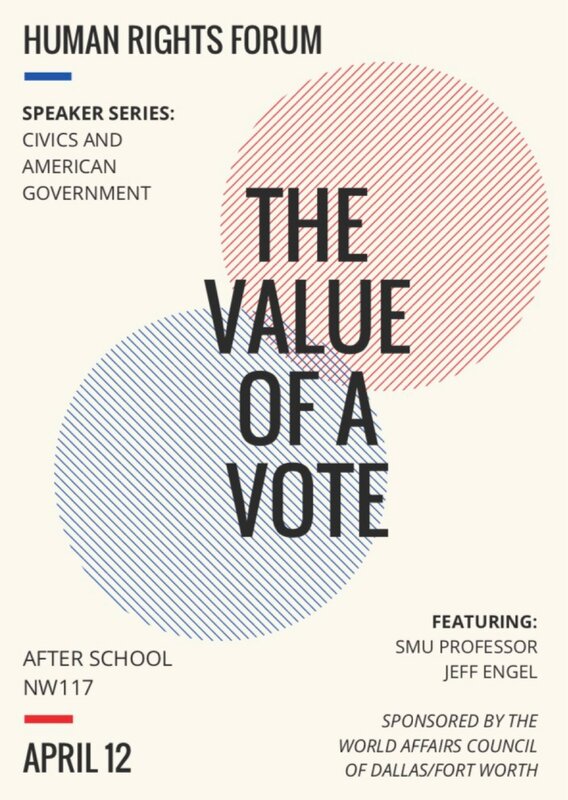 Professor Engel drove home the idea that in order for our democracy to function, citizens must participate. To do right by the Vietnam minority veterans who were fighting to uphold democracy in Vietnam while simultaneously not enjoying these same rights at home, we must exercise our civic duty of voting. We were encouraged by the great turnout we had! It shows how much young people must be involved in shaping this country's future. After the 2016 election, we were left feeling shocked, disheartened, and discouraged. We thank Professor Engel for reminding us that it is our duty to stand up and to speak up. There’s no doubt that every attendee left his visit feeling as patriotic and committed to America’s values as ever. Kathy Pham, our incoming student President, found his speech very interesting and thought-provoking. Emily Clark, a future Aggie, thought he was inspiring. She is never going to skip voting. Ever. Several of Mr. Hardy's French beginners said this was the best thing they'd heard all year. A big thanks is deserving of Amy Miller, the Director of Education at the WAC of DFW, for setting this up! We are continually grateful for these amazing opportunities afforded to us through our involvement in Junior World Affairs Council. Explore the pictures from the guest speaking event below! 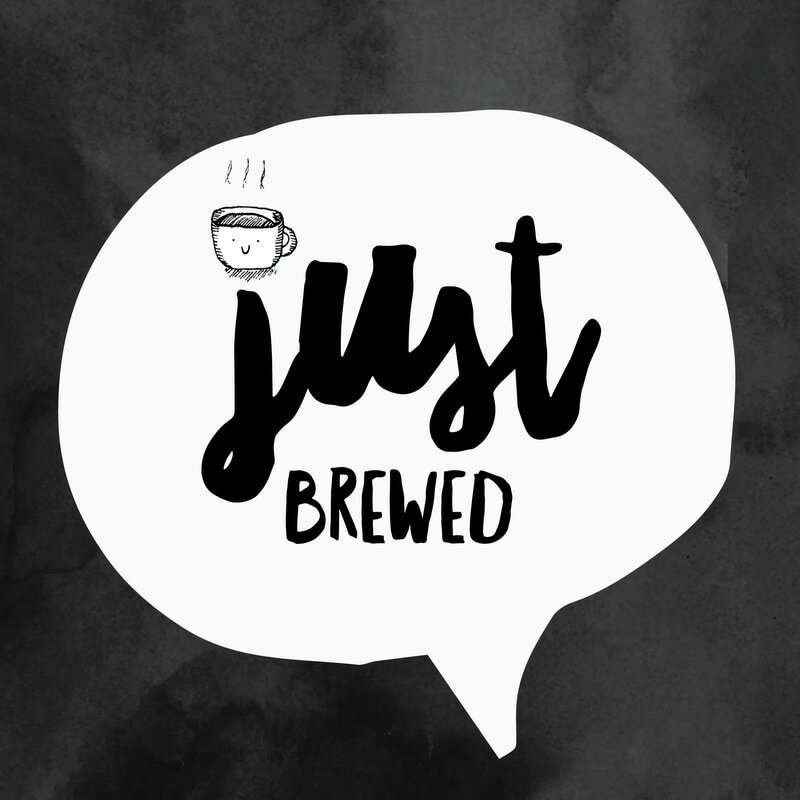 Just Brewed was truly a labor of love. The coffeehouse fundraiser was a one-night event that took place in the Newman Smith High School Rotunda at 7 PM on Friday, March 3rd. The night consisted of poetry readings, spoken word performances, and a silent art auction. Attendees also got to eat delicious coffeehouse foods while mingling with others about the importance of education. All proceeds from the event went to Room to Read, a nonprofit working to help children gain access to education in Asia and Africa. The organization is dedicated to universal literacy and gender equality in education because it believes that education will help children break the cycle of poverty to reach their full potential. The $305 we raised at Just Brewed is enough to support a year of life skills education for a girl in secondary school- how amazing is that?! Ms. Payne, the Smith librarian, said this event was "the best thing" she had ever seen at our school! To everyone who planned and participated, please know how proud we are of you! The planning for this event began last May when Ms. Hardy, our former sponsor, was reading Creating Room to Read by John Wood, the founder of Room to Read. We wanted our big annual project to be a coffeehouse fundraiser and RTR was the perfect nonprofit to support! We love that Room to Read has Read-A-Thon initiatives! We knew it'd be a great campaign to have at Smith, since we love reading! Our goal was to read 5,000 hours as a school. With the help of the amazing English department, we were able to read 8,211 hours in four weeks! We are honored that Room to Read donated $2,500 in our name towards building libraries/schools, publishing native language books, and other literacy projects. They even presented us with a large check! Pictures from the check presentation with Jean Lamberty and Debbie Dennis of the DFW chapter of RTR can be found in the slideshow above! We thank you so much for sharing our vision of a more compassionate world where all children can reach their full potential by having access to a quality education. We rest easy knowing that organizations like Room to Read exist and advocate for education as a human right. World change starts with educated children! The United States government is powerful in that it is a government of the people, by the people, and for the people. We, as citizens, have the power to demand our representatives to speak for us and for our rights. It is their job to hear our voices and to act on our concerns. We've gathered a list of our Carrollton, Dallas, State, Texas, and National representatives below. Handwriting letters is always more powerful and more like to be read than emails, however, emails are more convenient. Please take the time to email at least one representative from each government level (start with local). Before emailing, research a topic that you would like to write about and check how your representative voted on that issue (and if they agree with you). Tailor your response based on these things. After you've finished emailing, take some time to write messages of love for refugees! Some of the websites listed below choose their favorites to be translated to refugees in camps. You can always visit this page at home, handwrite a letter, and mail or deliver it yourself! We recommend only handwriting letters to the Speaker and the President- they actually select some to read and they do not read emails. Refugees and displaced peoples are living in unforgiving circumstances. A certain ban has made traveling to and from the US extremely difficult and unpleasant for them. We should take the time to tell them how much they matter and how we will always welcome them with open arms. I am writing to urge you to vote to close the deadly loopholes in our laws that make it too easy for dangerous people to get guns. The federal government currently can’t block firearm sales to suspected terrorists, and I’m begging you to close this deadly loophole in our gun laws immediately. The bottom line is this: Lax gun laws allow suspected terrorists to buy guns on our soil. Organizations like Al-Qaeda are well aware of this, and even instruct would-be terrorists to exploit them in the U.S. If you’re a suspected terrorist, you shouldn’t be able to buy a gun, and I hope you will address this glaring national security issue. Background checks are supported by over 90% of all Americans and are a commonsense tool for keeping guns out of the hands of criminals, terrorists, and the dangerously mentally ill.
It’s time to end the epidemic of gun violence in our country. Thank you for doing what is right for the people of [your state] and the United States. ﻿Read-A-Thon for Room to Read! Newman Smith High School's Human Rights Forum is excited to announce that we will be hosting a schoolwide Read-A-Thon to support the incredible work of the literacy nonprofit organization, Room to Read. Room to Read "seeks to transform the lives of millions of children in developing countries by focusing on literacy and gender equality in education. Working in collaboration with local communities, partner organizations and governments, [they] develop literacy skills and a habit of reading among primary school children, and support girls to complete secondary school with the relevant life skills to succeed in school and beyond." The Human Rights Forum is honored to help an organization that "envision[s] a world in which all children can pursue a quality education that enables them to reach their full potential and contribute to their communities and the world." Read-A-Thons are fantastic ways to reinforce good reading habits in our own school while raising funds to support literacy in the developing world. Today, there are over 770 million illiterate adults in the world and close to an additional 100 million children who are not enrolled in primary school. That’s nearly 1 billion people who do not have basic reading and writing skills, 2/3 of them are girls and most live in Asia and Africa. R2R is working to improve these conditions by establishing thousands of libraries in the developing world and filling them with books to ensure that all children have the opportunity to expand their horizons, nurture their curiosity and gain access to life-changing literacy skills. By hosting a Read-A-Thon at our school, students will give the gift of literacy while strengthening their own reading abilities. Proceeds raised through this Read-a-thon will fund new libraries in Asia and Africa and will help create high quality, culturally relevant children’s books published in local languages, so that young students in the developing world can learn and grow. They will also help girls' education efforts, since many girls around the world are unable to go to school or reach their biggest aspirations. We believe every child has a right to learn, to feel respected, to dream, and to feel inspired. Thank you for sharing our vision. Watch the videos below to see Room to Read's profound impact firsthand. (You may have to turn on closed captions for some of them). The Newman Smith High School Human Rights Forum presented virtually at the 2016 Global Education Conference at 4:00 PM (US central time) today, Monday, November 14th. Our target audiences are students and teachers interested in building better global citizenship in their schools and in raising awareness about different human rights issues around the world. Through the Global Education Conference, we hope to encourage educators to create similar organizations on their campuses and to help them through the process of initiating, organizing and activating their own human rights programs. We presented our past projects, conferences, and events that we have on our webpage. We discussed the steps that need to be taken in order to successfully create similar projects, and presented our idea for a future non-profit fundraiser that will take place in February of 2017. It would mean so much to our students to have you in the virtual audience. A big thanks to Ms. Hardy for tuning in from Stanford and for initiating our involvement in this! Mrs. Cullins also deserves a big hug because she hopped on board the night before and stepped in to flawlessly present when Ms. Hardy's computer wasn't cooperating. 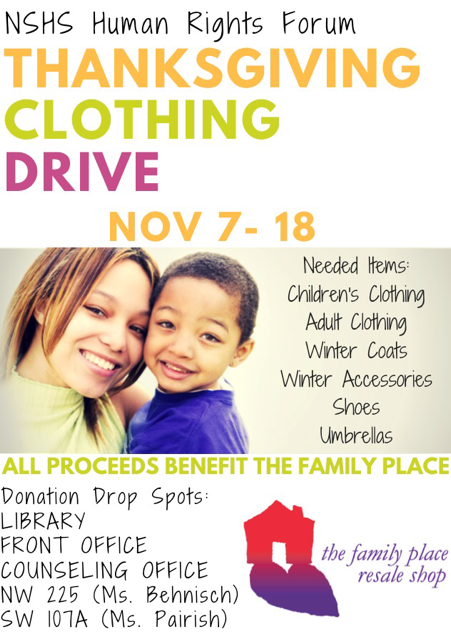 We were so lucky to have Mrs. Cullins there since she is a founder of our organization. And last but not least, thank you to Ms. Behnisch for perfectly delivering information about her amazing initiative benefiting our ELL students, Project Connect. To anyone who tuned in, it means the world to us that you are willing to hear our story. We hope to always inspire a shared sense of humanity among our students, our school, our community, and our world. Our 2nd Videoconference w/ Ukraine! We were so excited to speak with our Ukrainian friends again. This meeting was even more enlightening than the last. We spoke about the different organizations we have at both of our schools, how we feel about the US presidential election, and how both of our countries protect children's rights. The Ukrainian teacher, Ms. Natalya, and one of the students, Liza, had the great idea to exchange Facebook and Skype information so that we can become pen pals. Watch our videoconference in the YouTube video below! Pictures that Ukraine sent us! We are so excited to be connecting with a school at the caliber of School 13. As you can see from the pictures they sent us below, the school works closely with UNICEF to advocate for children's rights. Read this article to get a better idea of the school's mission. Our next videoconference with Ukraine is: Thursday, October 20th @ 7:30 AM in NW 225! We will be discussing different human rights with them including: children's rights, how society fights violence with family, and our presidential election and how it will affect Ukraine. School 13 will tell us more about their work with various human rights organizations, as well how UNICEF is helping them. Our first videoconference with School 13 in Ukraine! Our first e-meeting with School 13 in Slovyansk, Ukraine was amazing! We realized how frustrating technology can be in communicating halfway across the world, but it was a great experience nonetheless. The Ukrainian students shared their school stories and we shared ours. We are looking forward to learning more about the honorable and admirable work that the Ukrainian students do at our next videoconference!